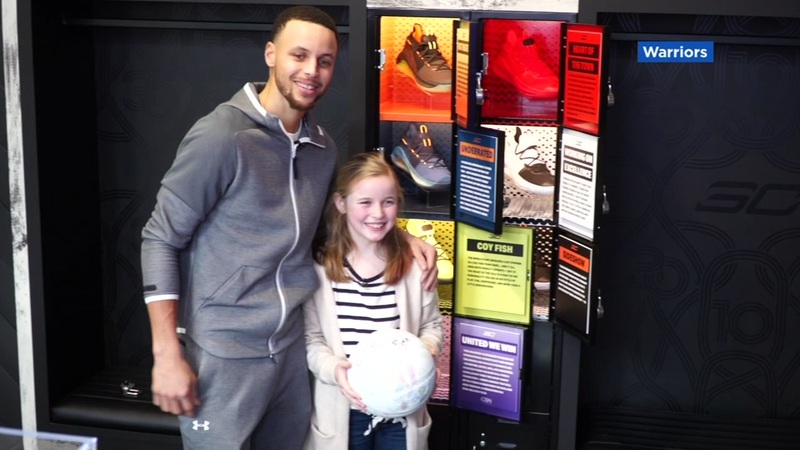 OAKLAND, Calif. (KGO) -- A special version of Warriors star Stephen Curry's signature Under Armour sneakers inspired by a 9-year-old Napa girl has sold out in just 1 day! The shoes went on sale Friday. Back in November, Riley Morrison wrote Curry a letter asking why his sneakers weren't offered in the girls' section of the company's website. Curry promised he'd do something about it. He and Riley met in Oakland on Thursday. He unveiled the "Curry 6 United We Win Colorway" in celebration of International Women's Day. Stephen Curry and Riley Morrison pose for a photograph on Thursday, March 7, 2019 in Oakland, Calif.
"It's a really special experience. I've never imagined that this would happen, really happy I wrote that letter and I'm really happy he wrote back to me," Riley said. Riley helped design the shoe's sockliners with inspirational messages like "Be Fearless" and "Rock the Currys." Proceeds from the shoe sales will fund an annual scholarship for female Bay Area students.